Ford's 2013 F-150 pickup truck sits on display at an event in Bruceville, Texas, on Monday. The new F-150 introduces new front-end styling and other features such as voice-activated driver controls and high-intensity discharge headlamps. DETROIT (Bloomberg) -- Chrysler Group LLC and Ford Motor Co. are testing the limits of truck buyers' appetite for pickups loaded with leather, chrome and heated seats at price tags that can top $50,000. It took just three days for dealers to snap up the full-year's allotment of Chrysler's new luxury-trim Ram Laramie Limited pickups, brand President Fred Diaz said in an interview. Ford, whose F-Series has been the top-selling vehicle line in the U.S. for 30 years, said this week it will add a range-topping Limited luxury model later this year. "I don't know if you can put enough bells and whistles on trucks," said Hayden Elder, the owner of a Chrysler dealership in Athens, Texas, 75 miles southeast of Dallas. "In my mind, I never have enough high-end trucks." The interest in luxury pickups suggests underlying strength in the U.S. auto market, where investors have been reluctant to add exposure due to concern that higher-profit trucks as a portion of vehicle sales will deteriorate, according to Itay Michaeli, an analyst at Citigroup Inc. While light trucks have lost 1.6 percentage points of U.S. share this year, used pickup pricing has remained stable and the number of long-lasting trucks on U.S. roads continues to climb, he said. "Automakers are warming up to the view that there is potentially far more pent-up demand for pickups than commonly believed," said Michaeli. "If you buy a pickup, there is probably some level of utility that you wanted, and if you had so much money that you could afford to buy a pickup for fun, you may still have a lot of money and still continue to do that." Chrysler begins production today of the Ram 1500 Laramie Limited in Warren, Mich. With a heated steering wheel, ventilated front seats and heated rear seats, it displaces the Laramie Longhorn as Chrysler's most expensive truck. Equipped with extra chrome and cowboy-boot inspired leather stitching, the Longhorn helped boost Chrysler's pricing last year. About 13 percent of light-duty Ram pickups sold for at least $40,000, up from 9 percent in 2010. Among heavy-duty Rams, 29 percent sold for at least $50,000 in 2011, up from 22 percent a year earlier. "That gave us the rationale and a business case to build Limited," said Diaz, the brand chief. "There are guys in New York, in Florida, in the Midwest and in the Northwest who aren't exactly into that cowboy, southwestern, barbed-wire feel." With all of the Laramie Limiteds scheduled to be built this year already spoken for by dealers across the country, Chrysler is working with parts suppliers to try to boost production, Diaz said. Chrysler says the Laramie Limited is a "Platinum fighter," a reference to Ford's F-Series Platinum, which has heated and cooled power front seats in black or pecan leather, along with Ford's Sync voice-controlled infotainment system. Later this year, Ford plans to add a fancier model called the Limited, though it hasn't announced details on features and pricing. When Ford introduced the Platinum for the 2009 model year the company expected it would account for about 3 percent of F- 150 sales, said Doug Scott, marketing manager for Ford truck. Platinum has more than doubled the company's forecast by consistently making up at least 6 percent of F-150 mix, he said. A $40,000-plus King Ranch edition of the F-Series caters to Texas tastes with its 8-inch touch screen, Sync infotainment hub and dual USB ports amid the black interior with wood-grain appliqués. More interested in snakeskin leather accents? 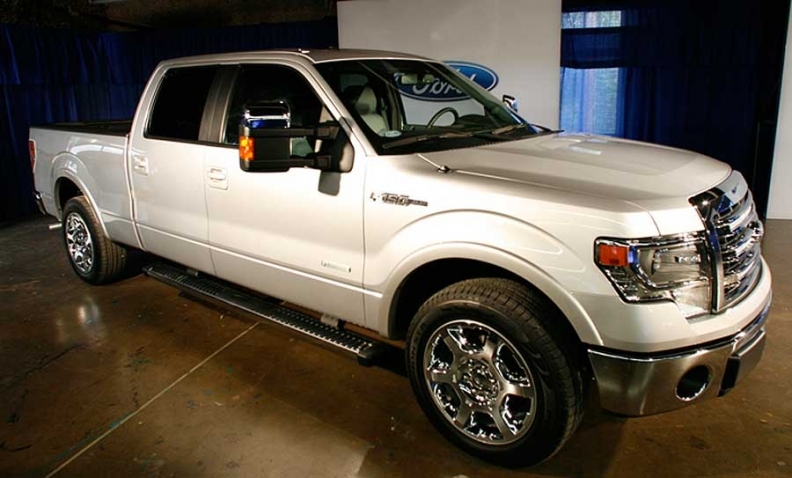 Check out the Ford Harley-Davidson F-150 that starts around $50,000. "The truck market, maybe a little less so today but in general over this last three- or four-year period, has been made up of a higher mix of more-affluent people," Scott said. A rebound in pickup demand will partly stem from a housing recovery, said Jeff Schuster, an analyst at LMC Automotive in suburban Detroit. Contractors have held on to older equipment and delayed replacement as they "ride out" the decline in construction activity, he said. LMC estimates pickups will slip to 12.7 percent of the U.S. auto market by 2016, from 14.1 percent last year, mainly because of challenges in housing and a consumer shift toward smaller vehicles. Automakers are more confident. Sales of 2 million full-size pickups annually in the U.S. "is certainly in the planning horizon," Ford's Scott said. "There's a lot of profit to be made at those levels." General Motors Co. added the Denali premium name to its GMC Sierra pickup line in 2010, and this year the sub-brand has made up 35 percent of heavy-duty Sierra retail sales, up from 15 percent in 2010, said Tony DiSalle, vice president for GMC marketing. A heavy-duty Sierra Denali sells for about $3,000 more than a Sierra SLT, which starts at $40,425. "We've seen consumers gravitate to Denali," DiSalle said. "Buyers want the comfort and luxury amenities in a highly capable vehicle."